In Europe during the 1850s, attempts were being made to standardize breeds. The dogs were bred to preserve traits that assisted in their job of herding sheep and protecting flocks from predators. In Germany this was practiced within local communities, where shepherds selected and bred dogs. It was recognized that the breed had the necessary skills for herding sheep, such as intelligence, speed, strength and keen senses of smell.The results were dogs that were able to do such things, but that differed significantly, both in appearance and ability, from one locality to another. With the rise of large, industrialized cities in Germany, the predator population began to decline, rendering sheepdogs unnecessary. At the same time, the awareness of sheepdogs as a versatile, intelligent class of canine began to rise.Max von Stephanitz, an ex-cavalry captain and former student of the Berlin Veterinary College, was an ex-member of the Phylax Society who firmly believed dogs should be bred for working. He admired the intelligence, strength and ability of Germany's native sheepdogs, but could not find any one single breed that satisfied him as the perfect working dog. 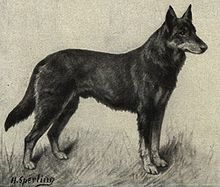 2-year-old black German Shepherd In 1899, Von Stephanitz was attending a dog show when he was shown a dog named Hektor Linksrhein. Hektor was the product of few generations of selective breeding and completely fulfilled what Von Stephanitz believed a working dog should be. He was pleased with the strength of the dog and was so taken by the animal's intelligence, loyalty and beauty, that he purchased him immediately. After purchasing the dog he changed his name to Horand von Grafrath and Von Stephanitz founded the Verein für Deutsche Schäferhunde (Society for the German Shepherd Dog).Horand was declared to be the first German Shepherd Dog and was the first dog added to the society's breed register. German Shepherds have a variety of colors, the most common of which are tan/black and red/black. Most color varieties have black masks and black body markings which can range from a classic "saddle" to an over-all "blanket." Rarer colour variations include the sable, pure-black, pure-white, liver and blue varieties. The all-black and sable varieties are acceptable according to most standards; however, the blue and liver are considered to be serious faults and the all-white is grounds for instant disqualification from showing in conformation at All Breed and Specialty Shows.